The majority of all fiberglass parts are constructed using polyester resins. Polyester resins are easy to use, fast curing, tolerant of temperature and catalyst extremes, and less expensive than epoxy systems.Polyester Resin is a liquid which when the catalyst is added, will cure to a solid. It has been specially formulated to cure at room temperature. 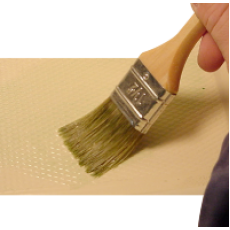 is used for initial coats on wood or for multiple applications with fiberglass cloth or mat. This resin is air-inhibited which means it will cure to a tacky finish and does not require sanding between coats. This is desirable in laminating because the layers adhere to each other better. This product should not be used as a final coat unless measures are taken to seal out the air during the curing process.